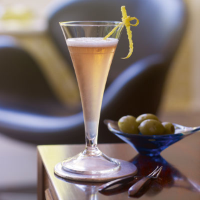 Celebrate Jubilee year with our patriotic version of the classic French 75. Shake the gin, lemon juice and sugar syrup together with the ice. Strain into a champagne flute and top up with champagne or sparkling wine. Garnish with a twist of lemon peel.